This is the story about Creation not the Creation of the Universe; not the Creation of the planet Earth but the Creation of a nation. Abraham has the unique distinction of being chosen to father a nation of people whose destiny was to serve a special purpose. Planned from the beginning of time by the Lord of Creation Abraham was chosen to fulfill His purpose for the establishment of His promised Kingdom On Earth. 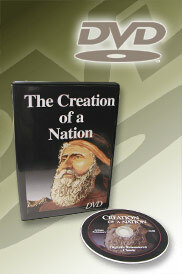 This video gives an excellent visual account of how the Lord of Creation planned from the beginning to create a nation through Abraham. It takes the viewer to the scene of God's Covenant with Abraham then follows the progression of his descendants all the way into modern America. ***New Lower Price of $19.95! *PLEASE NOTE: The E. Raymond Capt DVDs were copied from the original VHS videos which were produced in the 1970s and 1980s when the production techniques were not as sophisticated as today's. However the quality of the material presented is of the highest standard with each subject thoroughly explored and explained. Excellent not only for private viewing but also for Bible study groups and family and friends.